Maintained by: David J. Birnbaum (djbpitt@gmail.com) Last modified: 2017-10-13T18:23:53+0000 About this site: obdurodon.org is the development platform for David J. Birnbaum’s digital humanities projects. URL: http://aal.obdurodon.org Developers: David J. Birnbaum (djbpitt@gmail.com) and David Galloway (galloway@hws.edu), with the assistance of Audrey Wood and Maria Rogers Synopsis: Selected Russian fairy tales from the Aleksandr Afanas′ev collection with glosses and linguistic and cultural annotation. Designed to assist students in learning to read Russian fairy tales in the original Russian. URL: http://acl.obdurodon.org Developers: Danuta Shanzer (shanzer@illinois.edu) and David J. Birnbaum (djbpitt@gmail.com) Synposis: Online concordance of Alain de Lille’s (Alanus ab insulis) allegorical-philosophical epic, the Anticlaudianus . URL: http://aso.obdurodon.orgDevelopers: David J. Birnbaum (djbpitt@gmail.com), Anisava Miltenova (amiltenova@gmail.com). For a list of additional participants see the link at http://slovo-aso.cl.bas.bg/Synopsis: An archive of 140 brief XML-encoded descriptions of medieval Slavic manuscripts. URL: http://zatochnik.obdurodon.org Developers: David J. Birnbaum (djbpitt@gmail.com), Robert Romanchuk (rromanchuk@fsu.edu), and Matthew Herrington Synopsis: An XML-based medieval florilegium. Electronic edition of the Slovo i molenie Daniila Zatočnika . URL: http://digenis.obdurodon.org Developers: David J. Birnbaum (djbpitt@gmail.com) and Robert Romanchuk (rromanchuk@fsu.edu), assisted by Thuy-Linh Pham, Shaimaa Khanam, and Simon Prado Synopsis: Electronic edition of parts of Digenis Akritis . URL: http://pvl.obdurodon.org Developers: Donald Ostrowski (don@wjh.harvard.edu), David J. Birnbaum (djbpitt@gmail.com), and Horace G. LuntSynopsis: Electronic edition of the Rus′ Primary Chronicle ( Povest′ vremennyx let ). Read the text and examine manuscript variants. URL: http://icon.obdurodon.orgDevelopers: David J. Birnbaum (djbpitt@gmail.com), Erin Alpert, Irina Anisimova, Hillary Brevig, Alyssa DeBlasio, Julie Draskoczy, Olga Klimova, and Elise ThorsenSynopsis: Utility for studying the structure of Russian festal icons. URL: http://ft.obdurodon.orgDeveloper: Gabrielle Kirilloff (gkirilloff@gmail.com) Synopsis: Employs digital humanities techniques to analyze the use of speech in Russian fairy tales from the Afanas′ev collection. URL: http://gl-pt.obdurodon.orgDeveloper: Helena Bermúdez Sabel (helena.bermudez@usc.es) Synopsis: The goal of this project is to develop a digital edition which will shed light on the manuscript transmission of medieval Galician-Portuguese poetry, and particularly on linguistic textual variation, which may be crucial for determining the origin of the manuscript tradition. URL: http://genealogy.obdurodon.orgDevelopers: Christian Raffensperger (craffensperger@wittenberg.edu) and David J. Birnbaum (djbpitt@gmail.com) Synopsis: XML database for examining Riurikid dynastic marriages. URL: (currently off line)Developers: Rumjan Lazov and David J. Birnbaum (djbpitt@gmail.com)Synopsis: Unicode-compatible font for early Cyrillic. Original design by Rumjan Lazov, updated for Unicode 5.1 compatibility by David J. Birnbaum. URL: (currently off line)Developers: David J. Birnbaum (djbpitt@gmail.com), Roger Boyle (r.d.boyle@leeds.ac.uk), Quinn Dombrowski (quinnd@uchicago.edu), Predrag Matejić (matejic.1@osu.edu), and Kia Ng (k.c.ng@leeds.ac.uk)Synopsis: Electronic edition of N. P. Lixačev’s 1899 watermark album. URL: (currently off line)Developers: Viktor Baranov and David J. Birnbaum (djbpitt@gmail.com)Synopsis: Unicode-compatible font for early Cyrillic. Design by Viktor Baranov, remapped for Unicode compatibility by David J. Birnbaum. URL: http://menology.obdurodon.orgDevelopers: Cynthia Vakareliyska (vakarel@uoregon.edu) and David J. Birnbaum (djbpitt@gmail.com)Synopsis: A corpus of medieval Slavic and Greek calendars of saints that can be searched according to specific attributes of the manuscripts themselves and the commemorations they contain. The goal is to provide scholars with a large but manageable corpus of data for comparative study of calendar traditions, determination of the relationships between and among calendars, and analysis of any individual calendar. URL: http://obdurodon.org:8080/exist/ocs/glossary.htmlDevelopers: Oscar Swan (swan@pitt.edu) and David J. Birnbaum (djbpitt@gmail.com)Synopsis: Look up words in a glossary of Old Church Slavonic. URL: http://paul.obdurodon.orgDevelopers: David J. Birnbaum (djbpitt@gmail.com), Erin Alpert, Hillary Brevig, Drew Chapman, Alyssa DeBlasio, Julie Draskoczy, Yelena Forrester, Olga Klimova, Michelle Kuhn, Raffaele Ruggiero, Oscar Swan, and Elise ThorsenSynopsis: The “life of Paul the Simple” from the Old Church Slavonic Codex Suprasliensis with linguistic commentary, parallel Greek text, and a new English translation. URL: http://pavlova.obdurodon.org Developers: Sibelan E. S. Forrester (sforres1@swarthmore.edu) and David J. Birnbaum (djbpitt@gmail.com) Synopsis: Tools for studying Karolina Pavlova’s 1848 sketch Двойная жизнь ( Double life ). URL: http://repertorium.obdurodon.orgDevelopers: David J. Birnbaum (djbpitt@gmail.com), Andrej Bojadžiev (aboyadzhiev@gmail.com), Anisava Miltenova (amiltenova@gmail.com), and Diljana Radoslavova (radoslad@yahoo.com). For a list of additional participants see http://obdurodon.org/repertorium/history.html#participantsSynopsis: An archive of XML-encoded descriptions of medieval Slavic manuscript materials and research tools intended to aid in their study. URL: http://twitter.obdurodon.orgDeveloper: Janis Chinn (janis.chinn@gmail.com) Synopsis: Corpus-based study of linguistic properties of English-language tweets. URL: https://github.com/Pittsburgh-NEH-Institute/Institute-Materials-2017 Developers: Tara Andrews (andrews@univie.ac.at), Eleanor (Kyri) Bennett (ekb19@pitt.edu), David J. Birnbaum (djbpitt@gmail.com), Hugh Cayless (philomousos@gmail.com) Ronald Haentjens Dekker (ronald.dekker@huygens.knaw.nl), Na-Rae Han (Na-Rae Han), Gabrielle (Gabi) Keane (gabikeane@pitt.edu), Mike Kestemont (mike.kestemont@gmail.com), Leif-Jöran Olsson (leif-joran.olsson@svenska.gu.se), and Kaylen Sanders (kaylensanders@pitt.edu). Synopsis: Three-week NEH-sponsored Institute in Advanced Topics in the Digital Humanities. URL: https://github.com/DiXiT-eu/collatex-tutorial Developers: Tara Andrews (andrews@univie.ac.at), David J. Birnbaum (djbpitt@gmail.com), Elli Bleeker (elli.bleeker@uantwerpen.be), Ronald Haentjens Dekker (ronald.dekker@huygens.knaw.nl), Leif-Jöran Olsson (leif-joran.olsson@svenska.gu.se), Catherine Smith (c.j.smith@bham.ac.uk), Elena Spadini (elena.spadini@huygens.knaw.nl), and Joris van Zundert (joris.van.zundert@huygens.knaw.nl). Synopsis: Three-day workshop on the theory and practice of machine-assisted collation, with an intensive introduction to the open source CollateX collation program. URL: http://vilnius.obdurodon.org Developers: David J. Birnbaum (djbpitt@gmail.com) and Lou Burnard (lou,burnard@gmail.com) Synopsis: Four half-day workshop sessions on the use of TEI XML for editing and publishing medieval manuscript materials. URL: http://collatex.obdurodon.org Developers: Tara Andrews (tara.andrews@kps.unibe.ch), David J. Birnbaum (djbpitt@gmail.com), Ronald Haentjens Dekker (ronald.dekker@huygens.knaw.nl), Leif-Jöran Olsson (leif-joran.olsson@svenska.gu.se), and Joris van Zundert (joris.van.zundert@huygens.knaw.nl) Synopsis: One-day workshop on text collation with CollateX. URL: http://varna.obdurodon.org Developers: David J. Birnbaum (djbpitt@gmail.com) and Andrej Bojadžiev (aboy@uni-sofia.bg) Synopsis: Three half-day workshop sessions on the use of TEI XML for editing and publishing medieval manuscript materials. URL: http://www.wwp.brown.edu/outreach/seminars/publishing_2014-03/ Developers: Syd Bauman (s.bauman@neu.edu), David J. Birnbaum (djbpitt@gmail.com), and Julia Flanders (j.flanders@neu.edu) Synopsis: XSLT is a crucial tool for those working with the TEI, both as a key part of any XML publication system and also as a technology for manipulating and managing XML data. As a programming language that can be used to transform XML data into other formats, it is immensely powerful and also comparatively approachable for those already familiar with XML. For individual scholars and librarians (who may not have access to technical support or programmer time), XSLT can be a remarkably enabling skill, making it possible for them to create usable output in a variety of formats, including HTML, formats used by visualization software, and even PDF. The challenge for digital humanists is not in finding XSLT resources; because it is such an important technology, there are numerous tutorials online and workshops available. However, these materials and events are almost universally aimed at an industry audience, rather than at humanities scholars. What we seek to do in these seminars is provide an approachable introduction to XSLT that is aimed at a scholarly audience, using examples that can be extended and adapted to participants’ own data, and approaching the topic from the perspective of those who may be familiar with the TEI and XML, but not with other programming languages. This seminar will provide participants with an understanding of the essential concepts of XSLT, and also with the opportunity to experiment with some simple XML publishing tools such as XTF and TEI Boilerplate. URL: http://www.wwp.brown.edu/outreach/seminars/publishing_2013-11/ Developers: Syd Bauman (s.bauman@neu.edu), David J. Birnbaum (djbpitt@gmail.com), and Julia Flanders (j.flanders@neu.edu) Synopsis: This seminar will provide participants with an understanding of the essential concepts of XSLT, focusing on examples and use cases from TEI data in the humanities. We will also help participants learn how to use simple templates to create more complex XSLT stylesheets, and how to reuse and reverse engineer stylesheets from other projects. URL: http://malta.obdurodon.orgDevelopers: David J. Birnbaum (djbpitt@gmail.com) and Violeta Ilik (vilik@library.tamu.edu)Synopsis: Half-day tutorial, under the auspices of the Seventeenth annual conference on theory and practice of digital libraries (TPDL 2013), to explore the role of XSLT in digital library and digital humanities projects. URL: http://ghent.obdurodon.orgDeveloper: David J. Birnbaum (djbpitt@gmail.com)Synopsis: Three half-day workshop sessions on the use of TEI XML for editing and publishing medieval manuscript materials. URL: http://heidelberg.obdurodon.orgDeveloper: David J. Birnbaum (djbpitt@gmail.com)Synopsis: Five-day workshop on the use of XML-related technologies in the study of Slavic languages and literatures. URL: http://www.wwp.brown.edu/outreach/seminars/sc2013 Developers: Syd Bauman (s.bauman@neu.edu) and David J. Birnbaum (djbpitt@gmail.com) Synopsis: This seminar provides participants with an understanding of the essential concepts of XSLT, focusing on examples and use cases from TEI data in the humanities. Participants also learn how to use simple templates to create more complex XSLT stylesheets, and how to reuse and reverse engineer stylesheets from other projects. URL: http://ku.obdurodon.org/2013-03_ku-xml-workshop.htmlDevelopers: David J. Birnbaum (djbpitt@gmail.com) and Jeffrey A. Rydberg-Cox (rydbergcoxj@umkc.edu) Synopsis: One-day workshop designed to introduce new users to XML and XPath. URL: http://www.wwp.brown.edu/outreach/seminars/publishing_2012-12 Developers: Syd Bauman (s.bauman@neu.edu), David J. Birnbaum (djbpitt@gmail.com), and Julia Flanders (j.flanders@neu.edu) Synopsis: This seminar provides participants with an understanding of the essential concepts of XSLT, focusing on examples and use cases from TEI data in the humanities. Participants also learn how to use simple templates to create more complex XSLT stylesheets, and how to reuse and reverse engineer stylesheets from other projects. URL: http://ku.obdurodon.org/2012-09-21_ku-plectogram.htmlDevelopers: David J. Birnbaum (djbpitt@gmail.com) and Jeffrey A. Rydberg-Cox (rydbergcoxj@umkc.edu) Synopsis: Half-day workshop focused on using XSLT to transform XML into SVG plectograms. URL: http://www.wwp.brown.edu/outreach/seminars/xslt_2012-03 Developers: Syd Bauman (s.bauman@neu.edu), David J. Birnbaum (djbpitt@gmail.com), and Gabrielle Kirilloff (gkirilloff@gmail.com) Synopsis: This seminar provides participants with an understanding of the essential concepts of XSLT, focusing on examples and use cases from TEI data in the humanities. Participants also learn how to use simple templates to create more complex XSLT stylesheets, and how to reuse and reverse engineer stylesheets from other projects. URL: http://ku.obdurodon.org/2012-03_ku-xml-workshop.htmlDevelopers: David J. Birnbaum (djbpitt@gmail.com) and Jeffrey A. Rydberg-Cox (rydbergcoxj@umkc.edu) Synopsis: Two-day workshop focused on the use of analytical tools (especially the statistical package R and the topic-modeling toolkit Mallet) and methods (especially Bayesian classification and SVG visualization) to discover and explore information within XML data. URL: http://www.wwp.brown.edu/outreach/seminars/xslt_2011-07 Developers: Syd Bauman (s.bauman@neu.edu) and David J. Birnbaum (djbpitt@gmail.com) Synopsis: This seminar provides participants with an understanding of the essential concepts of XSLT, focusing on examples and use cases from TEI data in the humanities. Participants also learn how to use simple templates to create more complex XSLT stylesheets, and how to reuse and reverse engineer stylesheets from other projects. URL: http://www.wwp.brown.edu/outreach/seminars/xslt_2011-03 Developers: Syd Bauman (s.bauman@neu.edu) and David J. Birnbaum (djbpitt@gmail.com) Synopsis: This seminar provides participants with an understanding of the essential concepts of XSLT, focusing on examples and use cases from TEI data in the humanities. Participants also learn how to use simple templates to create more complex XSLT stylesheets, and how to reuse and reverse engineer stylesheets from other projects. Gin: a life list. After all, birders keep a list of all of the birds they’ve ever seen. Why an obdurodon? 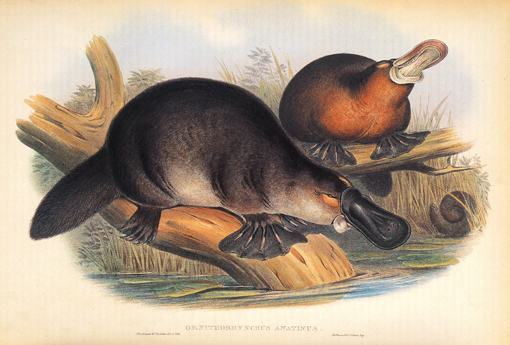 The other monotremes were all taken.